Deadly Woman Blues, stunning, original and brimming with life, is the first of its kind. 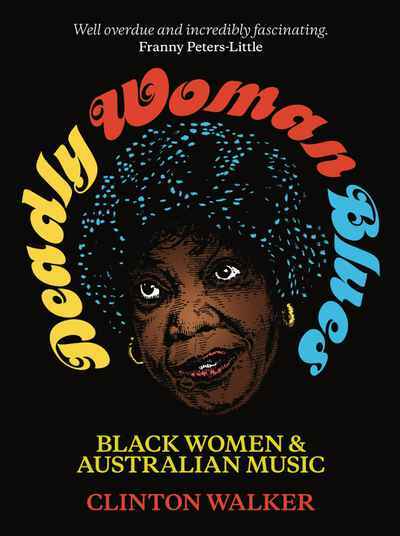 Part art book, part comic book, part biography and fully deadly, it is a unique graphic history of the black women who made Australian music. Traditional Indigenous music, spirituals, vaudeville, post-war jazz, country, gospel, soul, R&B and hip-hop have been made and re-made by these legendary women, some household names, some forgotten, some totally unknown until now. In this album of portraits, the long-awaited follow-on from Clinton Walker’s classic Buried Country, more than one hundred amazing artists are reborn. It’s as if a long-lost set of bubblegum cards has been found and remade for us, now. Starring Georgia Lee, Nellie Small, Candy Devine, Wilma Reading, Sibby Doolan, Ruby Hunter, Marlene Cummins, Tiddas, Carole Fraser, Christine Anu, Jessica Mauboy, Emma Donovan, Shellie Morris, Leah Flanagan, Crystal Mercy and many, many more singers and musicians, Deadly Woman Bluesis a story full of tears and joy, always beautiful and heroic.